I have a zine shop, and it's more up to date than this page, which is a mess! 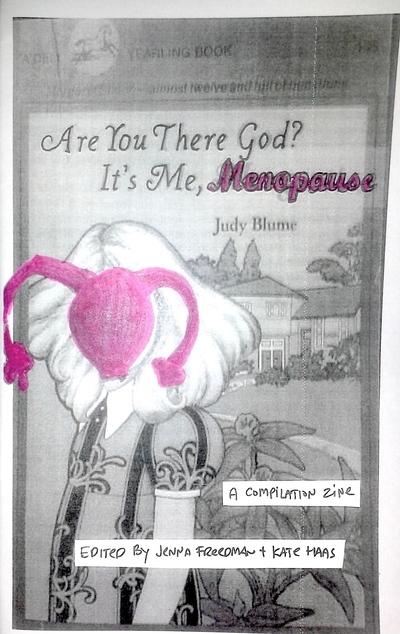 Contributors, all zine makers over 40, include Abby Koch, Andria Alefhi, Ayun Halliday, Carrie McNinch, China Martens, Elaine Harger, Jenna Freedman, Jude Vachon, Kate Haas, Kim R. Cody, Krissy Durden, Margarita Alcantara and Moe Bowstern. 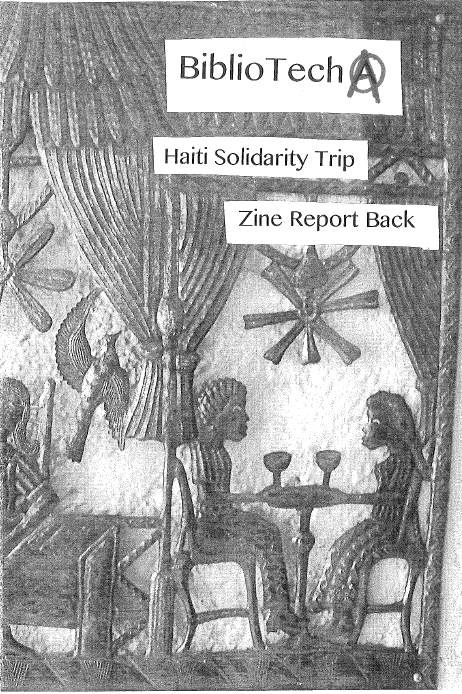 BiblioTechⒶ: Haiti Solidarity Trip Zine Report Back edited with Eric Goldhagen and Melissa Morrone, with contributions from Jessa Lingel, Damien Luxe and Richard Van Savage. Send a donation, for a copy. Proceeds will go to SAKALA. (Don't be creeped out by their affiliation with a religious organization. It's not like that. Plus, Haiti is massively Catholic, so that's how they roll.) 2013 My 2013 Winter Solstice Shout-Out and Reading Log. The Shout-Out is 48 half-size pages long and is about work, mental health and aging and also has a bunch of lists that as often as not feature photos of my cats and spouse. The spouse also contributed "What a First Time Marathoner Does." 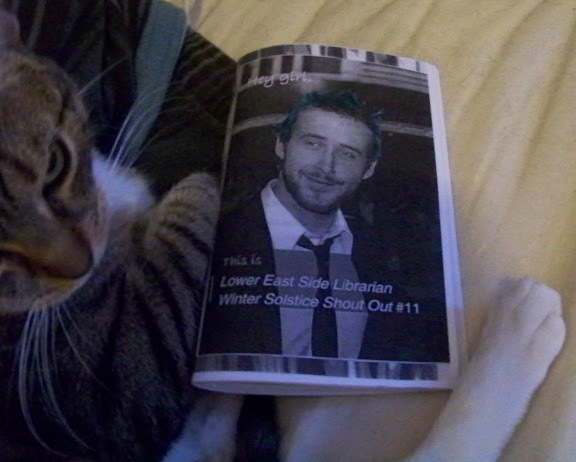 The Reading Log contains reviews of my favorite books and zines from December 2012-November 2013. It's 32 pages long and may also sport a photo of a cat. The pair of them were mad expensive to copy and send, so I'm afraid the price is $4 in person and $5 through the mail. 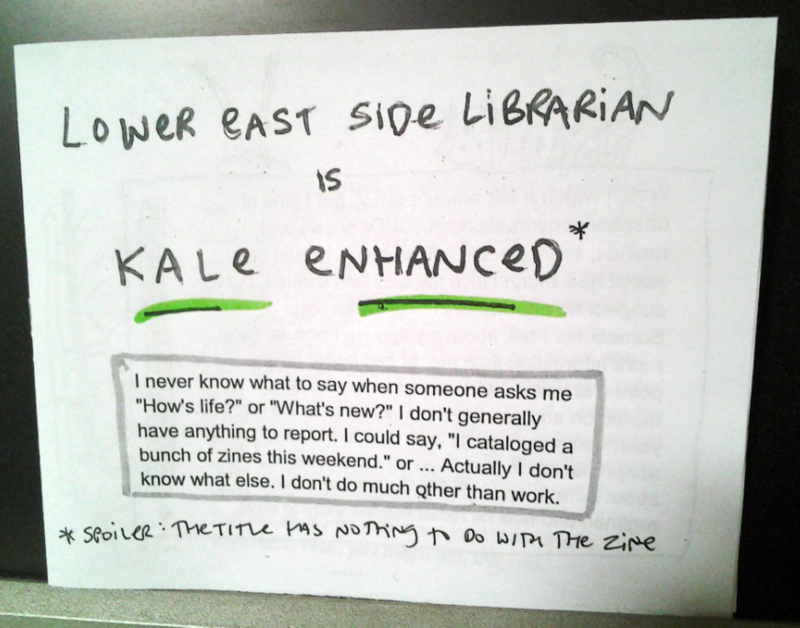 Kale Enhanced is a 6-hour zine I made at International Zine Library Day at Barnard. 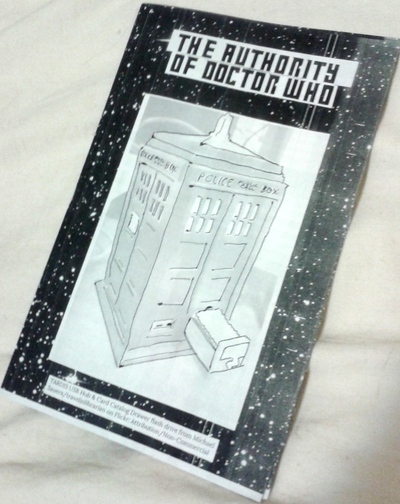 It's six quarter-size pages long and hand illustrated. It's basically about how boring I am. You can have it for any kind of trade or a stamp. 2012 That's my 2012 Winter Solstice Shout-Out and Reading Log. The former is 36 digest size pages and includes edited journal entries, "What a Prop Person Does" by Lisa Nagid, essays about college and hand-dominance, "live" tweets of a bat mitzvah and a list or two (band names!). 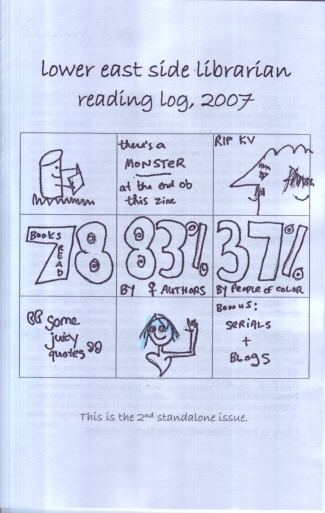 In the 24-page reading log I include reviews of 15 books and zines I read in 2012 and recommend highly, plus an account of my non-adventures during superstorm Sandy. The pair are $3 or possibly a trade (please ask first) and are only available to people I am not related to and don't work with. If you fall into either of those categories, I will gladly give you the reading log for free. 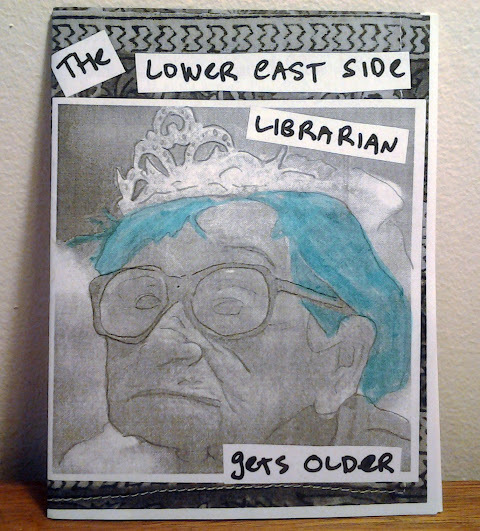 The Lower East Side Librarian Gets Older This was a 12-hour zine. It's short and raw, and is distributed only to close friends. 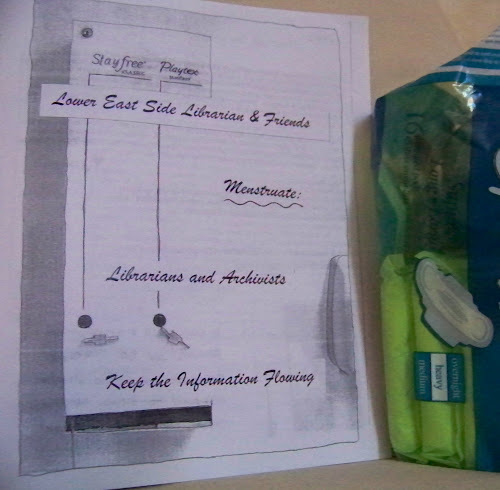 Lower East Side Librarian & Friends Menstruating: Librarians and Archivists Keep the Information Flowing. It's half-legal size and 48 pages long with essays, comics and a collage about all things menstrual. 2011 The Shout Out and Reading Log are bound separately. 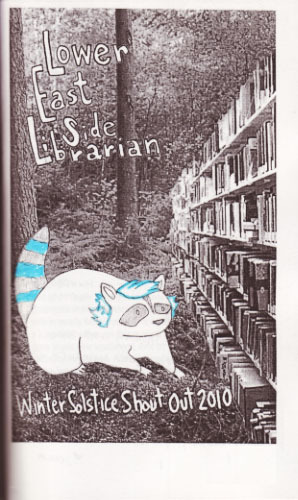 The latter includes reviews of my favorite books and zines I read in 2011. The former is a whinefest about getting older, having a hard time transitioning to a new job, and being sick of NYC. There are journal entries, a list that explains what is so bad about my cat Bad Bad Leroy Brown, two blog posts and contributed essays called What an Occupy Wall Street Librarian Does by Betsy Fagin and Dayenu by Milo Miller. Nicole Martin contributed the OWSL illustration. The Shout-Out is 54 pages, and the Reading Log is 38 pages. Both are 1/4 legal size and are sold together for $2 unless you are related to me, in which case you are only eligible for the Reading Log. Zine Tour Zine It's 24 half-legal pages and chronicles the 9-city zine tour I participated in during the summer of 2011 and costs $2. 2010 The Shout-Out and Reading Log are bound separately. Each is quarter-legal size. The Shout-Out is 46 pages and contains essays: on social awkwardness, aging, television watching, work, death and family, participating in a home birth lists: places least likely to find me and things I love the Facebook 15 authors thing illustrations: stick figure drawings by me, a contributed drawing by Marissa Falco, "What an Audiovisual Archivist Does" comic by Nicole Martin (who also drew the cover), map of my neighborhood a piece on marginalia by Rhonda Kauffman Half size, 35 pages. $2 (comes with Reading Log unless you're related to me, in which case you can't have the Shout-Out) The Reading Log is comprised of my favorite 12 book and zine reads of the year. 2009 The Shout-Out and Reading Log are separate, but attached. They're both half-size with purple covers. The Reading Log includes reviews of my favorite 20 book and zine reads of the year. The Shout-Out has quotes of the year, journal entries, an essay on sexuality, a cats are better than kids list, a day in the life of a librarian, a day in the life of a cat, an zine libraries conference report back, resolutions, thanks and no thanks. The illustrations are a kind of photograph tracing, and there are some free hand illustrations, as well. Lower East Side Librarian Winter Solstice Shout Out 2008 Contents: Journal entries Essay by Emily Drabinski on Gay Marriage Essay by Chris Dodge, "What an Indexer Does" Things I am thankful for Things that are not cat toys I feel secure when Guilty secrets Essay on being vegan Tribute to Partners the cat Zine quotes Lower East Side Librarian Reading Log 2008 Half size, 37 pages. Comes with Shout Out. $1 alone. 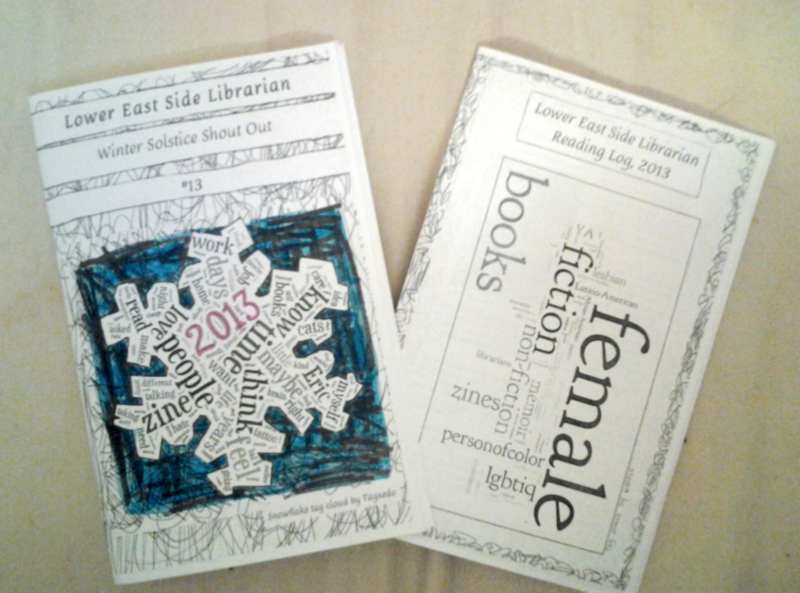 Contents: Reviews of 98 books (2 zines, actually) by 82 female authors 20 authors of color 12 queer authors 19 memoir/autobiography 10 other nonfiction 17 childrens and YA Lower East Side Librarian Winter Solstice Shout Out 2007 Half size, I'll get back to you on pages and contents. $2. Lower East Side Librarian Reading Log 2007 Half size, I'll get back to you on pages and contents. $2. Lower East Side Librarian Winter Solstice Shout Out 2006 Half size. 36 pages. $1.50, $2 with Reading Log, which it comes with unless we're related. Contents: Journal entries Quotes from books and zines The Taking Your Husband's Name Thing Librarians Are Righteous Dorky Library Humor Things That Are Revolutionary Why? Why? Why? 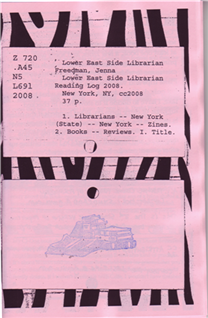 Good Stuff Lower East Side Librarian Reading Log 2006 Half size, quarter-size one page folding zine, 8 pages. $.50 or a first class stamp. 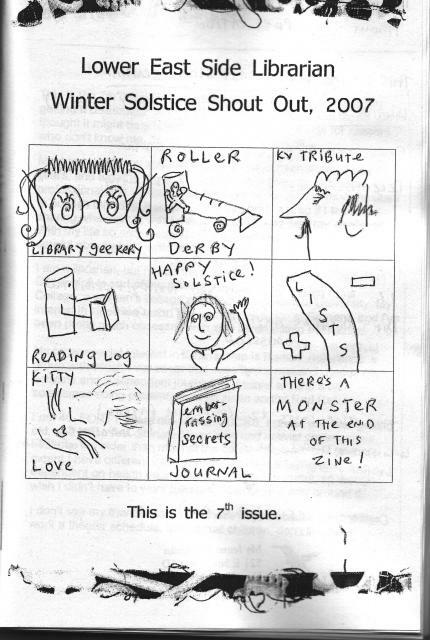 Lower East Side Librarian Winter Solstice Shout Out 2005 Quarter-size, 80 pages. $2. Contents: Writerly quotes Am I Your Jewish Friend? To Be Named Later (journal entries) Falling in love More book and zine quotes Why? Why? Why? 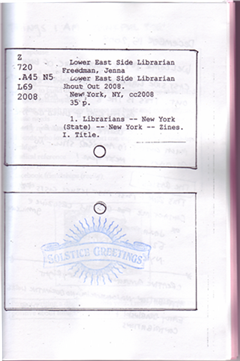 Anarchist Apologist Tattoos I'm Considering Reading Logey Good Stuff Lower East Side Librarian Winter Solstice Shout Out 2004 Half-size, 48 pages. $2. Contents: Cover by David Mulkey What an Electrician Does Days in the Life (journal entries) I Don't Understand Radical Reference at the Republican National Convention Assorted Quotes Reading Logey Abecedary (collaboration with Laura B. Gardner) Etiquette Guide to Riding Public Transportation (collaboration with Celia Perez "I Dreamed I Was Assertive") Good Stuff Lower East Side Librarian Winter Solstice Shout Out 2003 Half-size, 40 pages. $2. 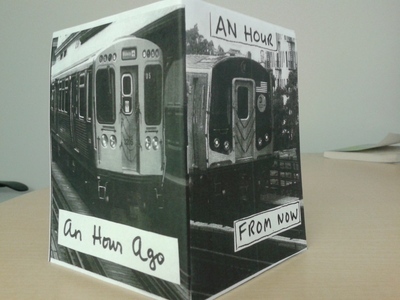 Contents: What a Librarian Does Long Day's Journal into Night Assorted Quotes Reading Log Coney Island Tribute 5th Street Tribute Good Stuff Lower East Side Librarian Winter Solstice Shout Out 2002 Still more newsletter than zine. I called it a "zineletter." Half-size legal, 20 pages. $1. Contents: La Vida Guatemala Reading Log Foo on Goo Jury Doody Cross Pedestrian Assorted Quotes Thanksgiving List Exit Stats Lower East Side Librarian Winter Solstice Shout Out 2001 Really more of a newsletter than a zine. 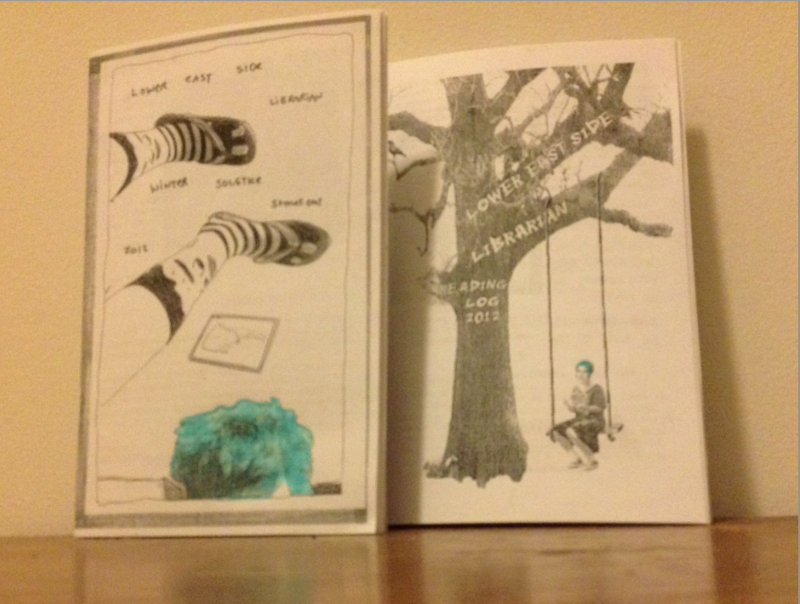 Out of print Zine correspondence should go to leslzine@gmail cxx. (figure out what the xes stand for) I accept cash through the mail and have a paypal account. Bluestockings and Quimby's also carry my zine--when I keep them stocked, anyway. You can write to me via snail: Jenna Freedman 27 Crooke Ave. #5D Brooklyn, NY 11226. I accept unsolicited trades only for library worker zines.